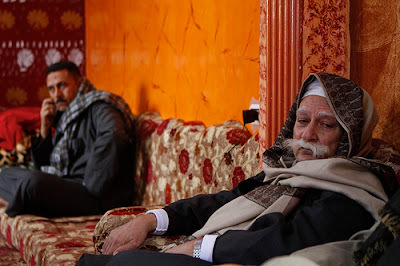 An account of what I understood has happened after a visit to the village of Sharbat, in the area of El Nahda in Amreyya, on the outskirts of Alexandria, where the decision to evict eight Coptic families after the burning of their homes and their stores stirred much controversy. On the way to Amreyya with my friends Sarah and Noov, we were stopped by a young police officer who searched the car incessantly for drugs. The young officer was typical. He was wearing a purple T-shirt , dark glasses and the gun in its holster were bulging out of his side. He asked me the usual questions as to what my work was and whether they were my friends and what we were doing. “I’m a journalist,” she said with an impatient voice and an annoyed grin. The small village of Sharbat is a little before the end of the world. It’s so secluded that I could not help thinking it’s forgotten enough that anything can happen. This is a place so remote from whatever law we have left in this lawless country. It’s a land so forgotten that we become aware of its existence every so often when something horrible takes place, but normal atrocities go by unnoticed. As soon as civilization ended, the flood of Al Noor’s party name and logo began. Beards were longer and women’s facial skin became rarer. Donkeys and carts shared the road with old cars, pick-ups and toktoks. The eviction of eight Coptic families from the village of Sharbat started as most stories of this kind do, with a man and a woman. A Christian tailor named Mourad Samy Gerges was rumored to have been with a Muslim woman and took explicit images of her. By the looks of things, this woman was well known in the village but it also seems that no one had seen these videos. Mourad was summoned by the police and kept overnight. The police found no evidence of the scandalous videos rumored to have been on his mobile. The account of what happened the next day is when the story becomes complicated. Abskharon also known as Abu Suleiman is the most prominent Copt in the village. He has four sons and owns numerous shops in the village. He was asked what the villagers should do with Mourad. He absolved himself of responsibility towards the tailor. He was assured by an ex NDP local councilor by the name of Essam Mussolini that his property will be protected if he closes his shops. Abu Suleiman and his sons reluctantly closed his shops and they were attacked and looted. The reason the shops were attacked is unclear. The villagers are said to have gathered around Mourad’s house even though he was in police custody. We know that Abou Suleiman’s youngest son Louis fired from his balcony in the air. There is some discrepancy as to why he fired. Mourad’s house is a stone throw away from Abu Suleiman’s house. Some witnesses at the scene have claimed that Louis fired to disperse protesters gathered at Mourad’s house. But if the numbers are anywhere near as large as what witnesses we talked to claim, they would have flooded the area enough to spill over near Abu Suleiman’s house. According to Suleiman, the eldest sibling, Louis fired birdshot when people gathered round their house and threatened to do to their women as Mourad did to the woman in question. Witnesses say that firing the shotgun from his balcony was what stirred the crowds. To confuse matters more, one of the mob, armed with an automatic machine gun unable to control the gun ended up injuring three of those surrounding Abu Suleiman’s house, one of them critically. The mob attacked the houses of Abu Suleiman and his family, broke into the shops located at the lower level of the residence, looted the merchandise and set fire to their buildings. Mohamed Galal, one of the few brave moderate residents who stood up for Abu Suliman during the attacks on his houses and managed to get them to safety at his residence just outside the village where they are currently staying. Many questions arise. Why was Abu Suleiman asked about Mourad’s fate? Why did people gather around Mourad’s house even though he was in custody? Why was Abu Suleiman and his sons asked to close their shops? Why were they not protected despite the promise from prominent figure Essam Mussolini? Why did the mob have automatic machine guns? Why would Louis fire had the mob not reached his house? Why were all Abu Suleiman’s properties and shops attacked at the same time? Why would the villagers threaten Abu Suleiman’s family despite not having anything to do with Mourad? Mohamed Galal suspects that there is a sectarian element that was used. Abu Suleiman had bought a piece of land and started building a community center. He suspects the villagers fearing it would soon be a church were motivated to make these attacks on his family, but we can never know for certain. Moussolini’s situation is precarious. Other than having a treacherous name, he involved Abu Suleiman’s family needlessly and insisted they shut down their shops. The Salafi Sheikh Sherif El Hawary in charge of reconciliation admits the mob might have comprised thugs not motivated by any religious purpose who may have been hired. But who would hire these thugs and to what end? Who has the connections and the power to hire these thugs? By the testimony of his neighbors, everyone loved Abu Suleiman. A local committee of seven, headed by Essam Mussolini and others said to represent the village deemed it unsafe for Abu Suleiman and his sons to stay in the village. Abu Suleiman and his family, already away from the city were asked not to return not because of Shari’a but for fear over their safety. The Salafi Sheikh Sherif El Hawary promised to protect Abu Suleiman using his Salafi men in the area, yet it feels that the Salafis are not what worry Abu Suleiman. Many people opposed solutions proposed by Salafis presented as Sharia’s verdict. Their property was to be auctioned off. Needless to say, Mourad’s family would be evicted. The Muslim woman would stay. Despite Muslim Brotherhood MPs attending some of the meetings, they were not part of the ‘reconciliatory hearings’ as per @ikhwanweb. As local media began covering the events, there was more pressure against the expulsion of Copts. The Salafis charged with handling cases through ‘reconciliatory councils’ welcomed back the families and promised compensation for the damages. The latest reconciliatory hearing was held on Thursday 16 February 2012, this time by the governor of Alexandria, numerous MPs and officials. The new reconciliatory committee reversed the decision regarding Abu Suleiman and the rest of his family. How and when they will return home will yet be decided. Compensations were not clear with the new committee. It feels that the story is long enough without a prologue and epilogue, but I feel I must comment on the entire incident. The prologue is part of the story, and the title for this entire story is the absence of the law. Even when the legitimate bodies, the governor, the MPs and officials were visiting, they created reconciliatory committee. It’s just like the officer who stopped us and searched us and asked about illegal substances in soft whisper. This is not a sectarian issue, this is a state issue. The absence of the law or even a chance at getting any sort of justice is at the heart of the matter. There may have been sectarian sentiments, but this is a story of an event mostly motivated either by envy or greed. Even if we were to consider whether this story is about honor, we discover that it wasn’t. This is a story of shame. These are people who react to shame not honor, they would not move an inch for a woman part stripped in Tahrir square and they are people not shamed by the coward of an army which did that. They are shamed when they realize they do not have control over their women. These remote areas are completely controlled by Salafi sheikhs. On the other hand they are leveled out by those who can hire thugs. The sheikh was not brought in to solve this issue exceptionally. The sheikh has a long list of ‘cases’ like a judge in a courtroom, trying to fix things for everyone based on his judgment and interpretation of religion. Some Copts come to him to solve their problems in this land of lawlessness and he may be as merciful or as brutal as he chooses to be, and the police will have no power over him in his jurisdiction. We may never know what motivated such attacks or what the real dynamics were but such places fill me with hopelessness. On the phone with Adel Abskharon, another son of Abu Suleiman, he was told “congratulations” for being allowed to return to his home. His voice was filled with joy for having escaped a cruel injustice. He was happy for the chance to rebuild his burnt down home and restock his looted store. He felt grateful to be given a part of what is his and that injustice did not extend beyond this. It feels that we’re all starting to feel this way. Once upon a time not so long ago we were seeking justice, now we’re happy to evade injustice. We celebrate whenever injustices are partially reversed, with our hopes back to being grounded into expecting no justice at all. On 25 January 2012, I was asked to comment on Egypt one year on. Other guests were Sharif Abdel Kouddous from Democracy Now and Nader Omran from the Muslim Brotherhood. Sharif did a great job expressing the state of affairs. Due to the presence of Nader, I had to highlight the true form the Freedom and Justice party had taken. This footage shows clearly police brutality in the events after the Port Said massacre in which the Ministry of Interior (MOI) was complicit. It refutes the usual claims by the Interior Minister that no shotguns were ever fired. An Egyptian wakes up almost one year after what he thought had been a finished revolution only to realize how abandoned and betrayed he is. There has been much talk about what Egyptians have gained over the past 12 eventful months. Well, the one thing we truly gained over this year worth anything is knowledge. We wake up each day and look around us in the knowledge that there’s no one truly on our side. With few friends far and between, we have only ourselves to rely on. We now have the knowledge that we are betrayed by our police, our judiciary, our legislature, our media, our army, our ministries, our parties and even our religious institutions. It was the spark lit on 25 January and the wildfire that followed which awoke us to the daunting realisation of these long-buried facts. Never has this systematic treason been put to as much use as it has since Egyptians took to the streets and tried to take back what is rightfully theirs. All institutions were utilised to subdue the will of the Egyptian people. The odds were stacked against us from the very start, more than we could have foreseen. The faces of our institutions have been laid bare and despite our expectations, these faces turned out to be uglier than we could have imagined. Injustices have been endured by Egyptians in great part through religion but all the more now it has become apparent that the leaders have betrayed the cause of their followers. al-Azhar does not hesitate to issue a ‘fatwa’ (Islamic ruling) if the Supreme Council of the Armed Forces (SCAF) so desires. The Coptic Pope does not think twice about singing the false praises of the ruling military junta, the murderers of his flock. The political parties which embrace Islam are ready to do their duty to manipulate the poor through religion and bribes, and defend the well-being and honour of the military, the rapists of our country. The mock Mubarak trials, the cosmetic change in government, the elections; all fulfill the prophesy. Instead of moving towards democracy, we are experiencing “the culmination of the slow-motion coup and the return of the somewhat austere military authoritarianism of decades past”. And what we have now is as Goldberg perfectly summed it up, “Mubarakism without Mubarak.” Nobody wants freedom for this country; those who have power to fix it do not have the will and those who have the will do not have the power. Egypt is not Tunisia, they once said. It’s true. If Egypt had been Tunisia we would have had more of a chance to of being liberated. State media has propagated the claim that foreign elements are undermining democracy efforts and they are, by supporting the brutal SCAF. Egypt has borders with Israel and that’s why we cannot be free. Egypt‘s military is controlled by United States interests and that’s why we cannot be free. Years of receiving billions of dollars in military bribes has created a monster of an army that is incapable of fighting anyone but its people. Years of corruption combined with these bribes have given a few men from the army control over 25% to 40% of Egypt’s economy. The army’s activities have shifted from defence-related investments to producing bottled water and pasta – well, at least they can’t run us over with those. We slave away for the murderers; their wealth grows as does the poverty of the people. Our country is ruled by a military junta. On 25 January they will be celebrating but Egyptians should be mourning. Protesters and revolutionaries will be mourning; they will be mourning their dead. 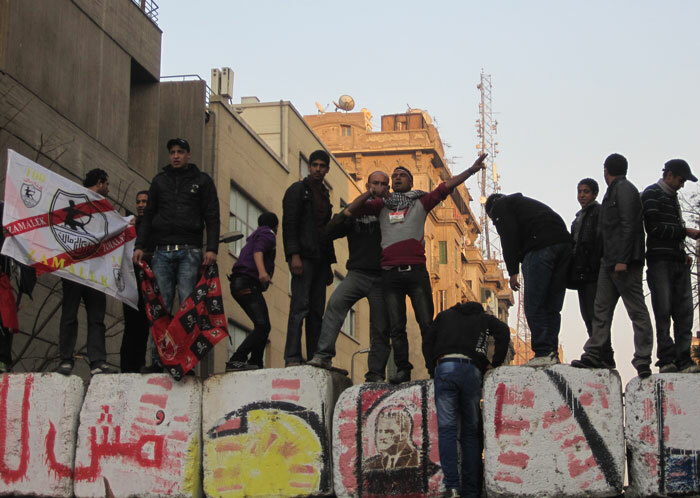 The SCAF will celebrate a triumph over a very pure and compelling revolution. They will celebrate the release of officers who killed protesters. They will celebrate keeping their corrupt men in their positions. They will celebrate their ability to kill Egyptians almost every month last year without reproach or repercussions. They will celebrate the fact that they are above the law and not one army or police officer was tried properly for their crimes - perhaps this is to ensure that others continue the execution of brutal orders the next time they are given. They will celebrate their control over the legislative, judiciary and executive bodies, and the press. They will celebrate the powers they will keep even after “handing over” power. They will celebrate taking every decision against the will of the people. They will celebrate the decisions they’ve taken to protect their interests at the expense of Egyptians. They will celebrate their power. They will celebrate their lies. We will mourn our wounded and our dead whose blood screams from the ground. 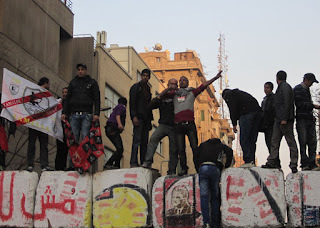 We will look back at the prospect of having taken down that venomous state television building known as Maspero. We will remember how we were tricked into thinking there was any honour in those dishonourable army men we foolishly trusted. We will mourn the institutions that we trusted and remember how they have sold us out. The first anniversary of the revolution is not a day for Egyptians to celebrate but to mourn our dead. A day to remember our awakening and a day to remember what we fought for. Perhaps it can also be a day to start fighting once again. A year has passed and we now know of our enslavement. A year has passed but the streets are full of marches and screenings of army brutality. But over that time I’ve seen many inspiring faces. I’ve seen brave Egyptians calling in the darkest times against their oppressors. I’ve seen valiant protesters walking into danger unarmed. I’ve seen them camped out in the cold in Tahrir and marching in the heat. I remember their faces and I know they have broken free and that for them there is no turning back. I cannot conceive of a way for these determined warriors to be subdued by an oppressive force that wishes them enslaved.